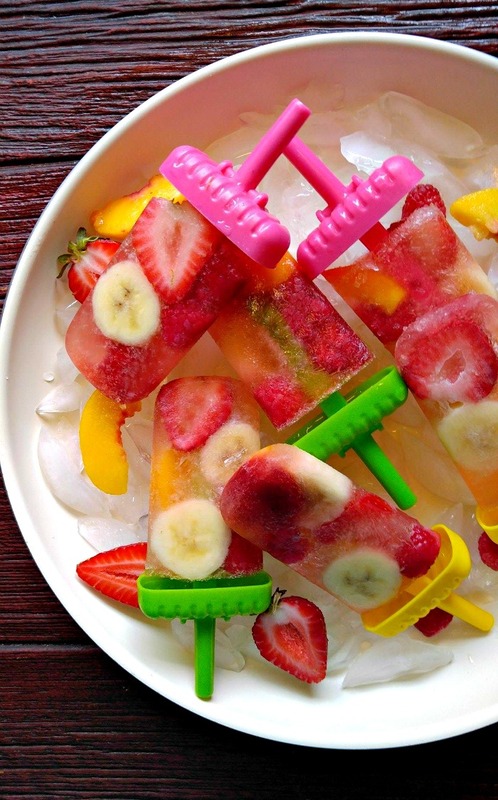 I love Popsicle recipes in the summer time. 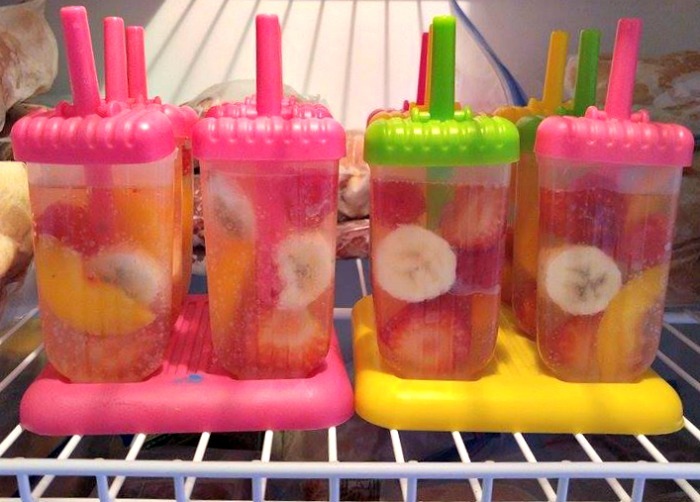 They are easy to make, fun to eat and really beat the heat. These champagne popsicles are a boozy sweet treat that is just for mum and dad though. No kids allowed! 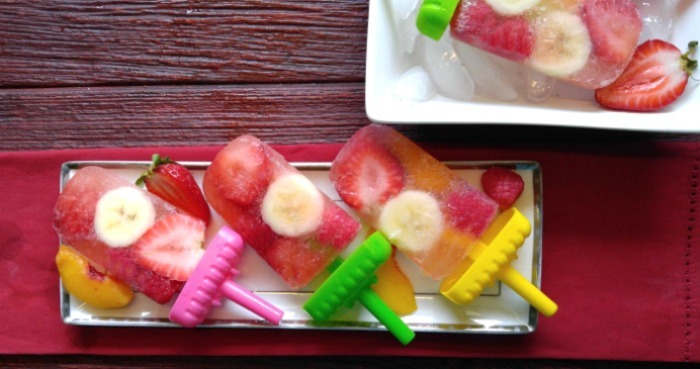 Making popsicles at home is a fun and inexpensive way to beat the summer heat. I’ve seen people placing a Popsicle into a glass of champagne to allow the champagne to soak up the alcohol, but today we will be making the Popsicles out of the champagne! Instead of pouring a glass of bubbly for your friends at your next summer party, you’ll be handing them a champagne infused frozen treat that is super easy to make. Cold desserts are a fun way to cool down on a hot summer day, but popsicles are not just for kids anymore. You can turn your favorite cocktail, wine beverage or champagne into a frozen treat with just a few ingredients. 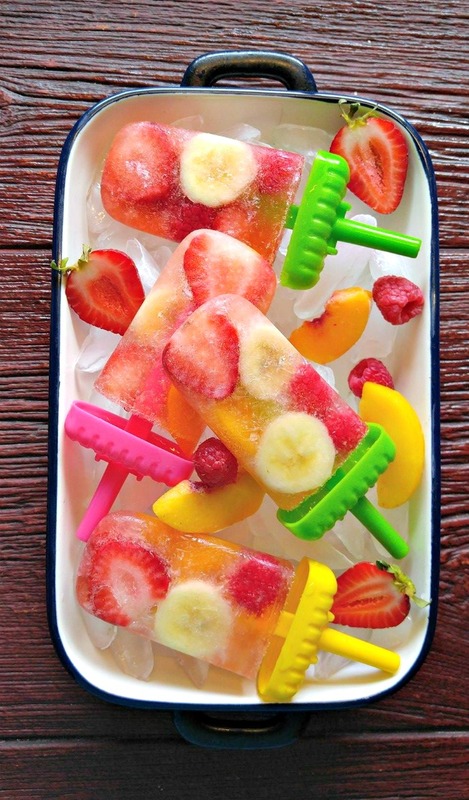 Today’s Popsicle idea uses a bit of the bubbly to add a burst of extra flavor and pop to your summer treat and lots of fresh fruit. I love using fresh fruit in popsicles, particularly in the summer months when the fruit is so fresh that you don’t need to add extra sugar. I used bananas, strawberries, peaches, and raspberries today. Look at those colors! 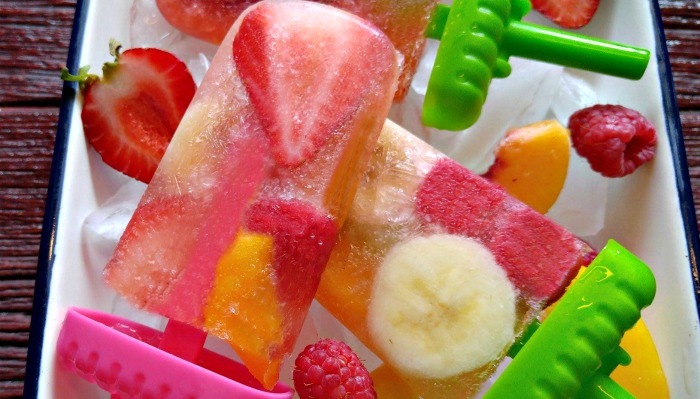 Making these icy pop treats could not be easier. 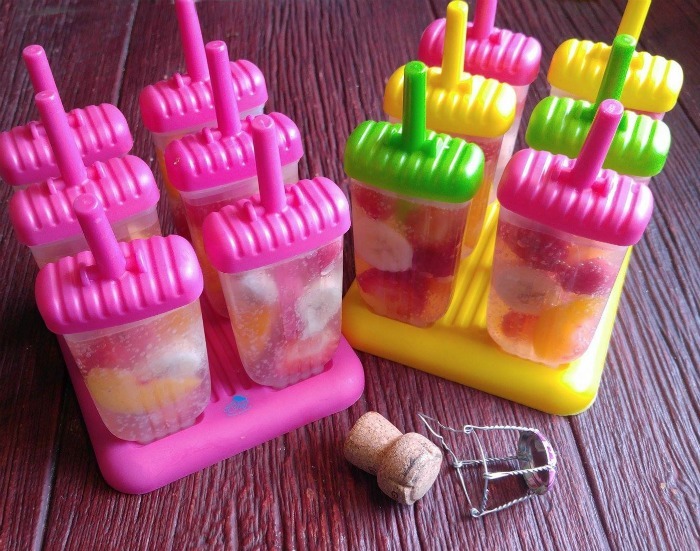 All you need is a bottle of champagne, some chopped fruit and Popsicle molds. There is no mixing or blending or pulsing at all. 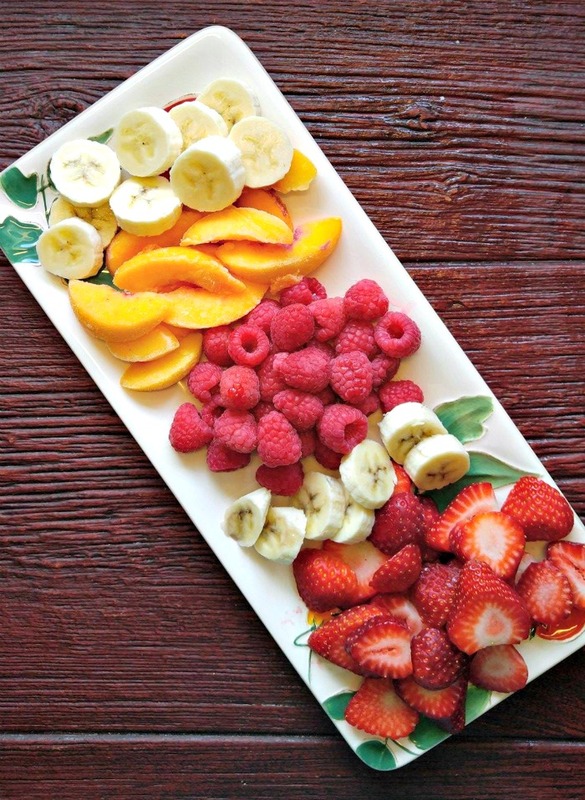 The only step in the preparation is to cut up some fresh fruit. You can make the pieces as small or as large as you want. I left my pieces large but sort of thin so that they make a pretty Popsicle but you can go finer if you like. 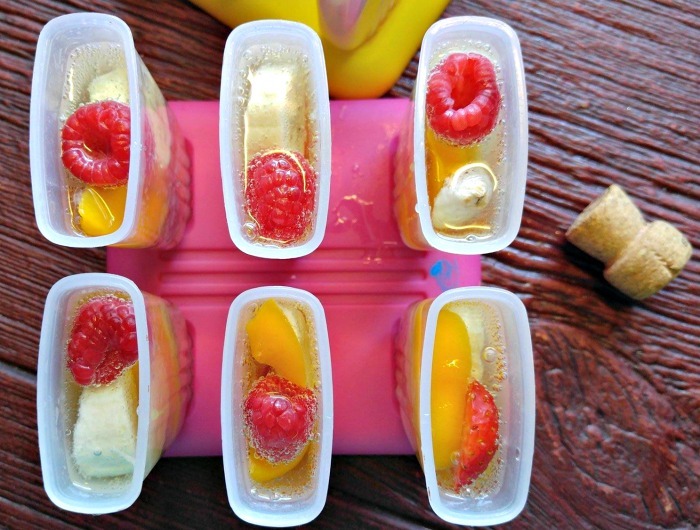 Just fill the Popsicle molds with the fruit, pour in the champagne and freeze. What could be easier than that? I alternated the fruit and filled the molds almost to the top. Now it’s time to open the bubbly and pour it over the fruit. I used a small glass measuring cup to make it easy to fill them. The champagne will bubble up to the top and then settle back. Just keep filling until they are about 7/8 full. Add the tops to your molds. Now they are ready to freeze. There is even a glass of bubbly left over. Now what should I do with that? Into the freezer they go for about 4 hours. Note on alcohol in popsicles: Remember that champagne (and other alcohol) has a lower freezing point than water does, so the popsicles will not be rock hard and will likely have a somewhat slushy texture when frozen, unless your freezer is set very low. The taste of these champagne popsicles is crunchy and slushy and boozy and so much fun! They are an all grown up frozen treat that will be sure beat the heat. Your friends will love them! These champagne popsicles are fun at summer BBQs and make a great treat for summer brunch on the weekend with friends. I love how easy they are to make. Mine were ready to freeze in about 10 minutes. Make a batch the night before a party and surprise your guests with one. 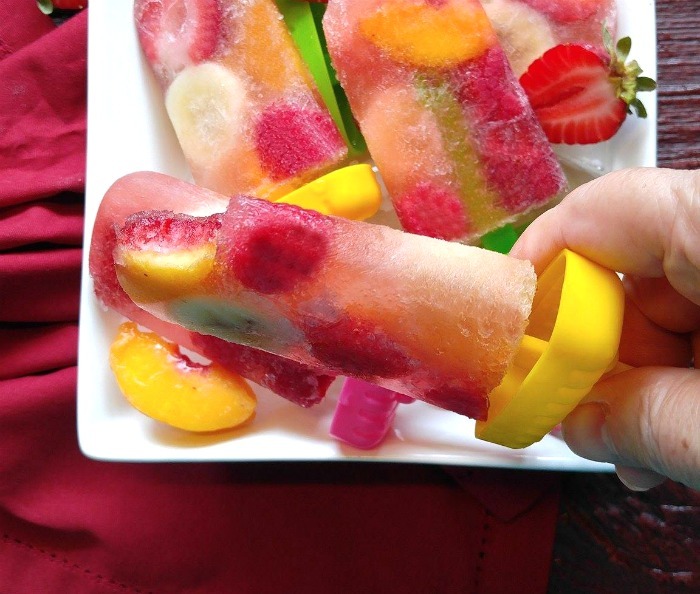 If you want to start, or end, your party in a fun way, serve up these delicious fruit filled champagne popsicles to your adult guests. 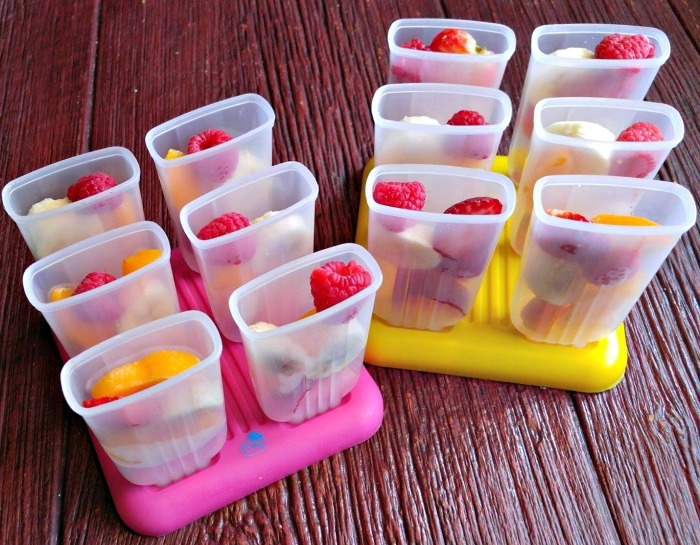 You can make the kids version by substituting fruit juice instead! Be sure to also check out these ideas for some great suggestions on what to serve for a summer dessert table for sweets that will take the heat without melting..
Slice your fruit into small chunks that will fit into your ice pop mold. Cover the molds and freeze for 4 hours until set.